If you are having an outdoor wedding reception, you are going to need a tent.But how to choosing the right one, with a good quality and resonable price, though, can seem like a daunting task, and they can be so expensive that you want to avoid making a costly error. Here are some of the key things to keep in mind when ordering your wedding tent. 1. The most important one is to find good tent manufacturer. A good manufacturer will offer you a good tent which can fix with different accessories, such as PVC sidewalls, glass walls, flooring system and so on. If the futuer, you may need some parts order for the tent, a good company will always meet your need. Second is the size of your location. You can only fit so much tent into any given spot, and you need to be sure to allow adequate room around the perimeter of the tent as well. If you are getting married at a venue that frequently hosts tented receptions, then it should be no problem for you to find out what size tent will fit the space. 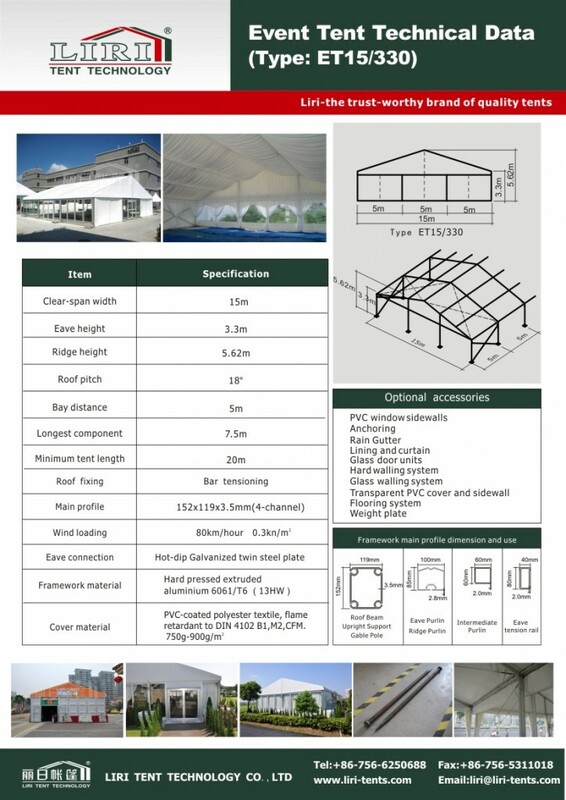 Normally, 500 people will be a hot size for different kinds of wedding, for this tent, please can think of a 15x40m tent, you can choose the accessories based on your need.